Vijaya Bank Recruitment 2019 - Below are various recruitment notifications published by Vijaya Bank / www.vijayabank.com. 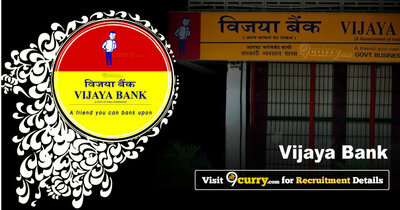 As of now, we don't have any active recruitment notification by Vijaya Bank featured here. We may update as soon as the organization announces a new job notification. If you are looking for any information related to previously organized recruitment drives by Vijaya Bank, you can browse through previous job notifications mentioned below and get the new updates or information you are looking for. Vijaya Bank Recruitment 2019 - Apply Online for 421 Peons & Sweepers Posts in Vijaya Bank, Ahmedabad, Gujrat, Bangalore, Karnataka, Bhopal, Madhya Pradesh, Chandigarh, Punjab Haryana, Chennai, Coimbatore, Tamilnadu, Delhi, Guwahati, Assam, Hassan, Hubli, Hyderabad, Telangana, Jaipur, Rajasthan, Kalaburagi, Kochi, Kamataka Kerala, Kolkata, Orisha, West Bengal, Kozhikode, Kerala, Lucknow, Uttar Pradesh, Ludhiana, Mandya, Mangalore, Meerut, Mumbai, Maharashtra, Mysore, Nagpur, Chattisgarh, Patna, Bihar. Online Applications are invited by Vijaya Bank from 07 Mar 2019 to 14 Mar 2019 for 421 vacancies. Vijaya Bank Recruitment 2018 - Apply Online for Chief Managers Posts in Vijaya Bank, Karnataka. Online Applications are invited by Vijaya Bank from 24 Oct 2018 to 09 Nov 2018 for 4 vacancies. Vijaya Bank Recruitment 2018 - Apply Online for 330 Probationary Assistant Manager Posts (Credit) in JMG Scale-I in General Banking Stream, Vijaya Bank, Karnataka. Online Applications are invited by Vijaya Bank from 12 Sep 2018 to 27 Sep 2018 for 330 vacancies. Vijaya Bank Recruitment 2018 - Apply Online for 57 Manager Posts in Vijaya Bank, Bangalore, Karnataka. Online Applications are invited by Vijaya Bank from 12 Apr 2018 to 27 Apr 2018 for 57 vacancies. Vijaya Bank Recruitment 2018 - Apply Online for Clerk Posts for Sports Men in Vijaya Bank, Bangalore, Karnataka. Online Applications are invited by Vijaya Bank from 12 Apr 2018 to 27 Apr 2018 for 10 vacancies. Vijaya Bank Advisor-Treasury Recruitment 2017 - Job notification for Advisor-Treasury Vacancy in Bengaluru on Contract Basis. Online Applications are invited by Vijaya Bank from 22 Nov 2017 to 09 Dec 2017 for 1 vacancy. Vijaya Bank Recruitment 2017 - Latest job notification for Chief Statistician Vacancy in Bangaluru, Karnataka on Contract Basis. Applications are invited by Vijaya Bank on or before 31 Aug 2017 for 1 vacancy.